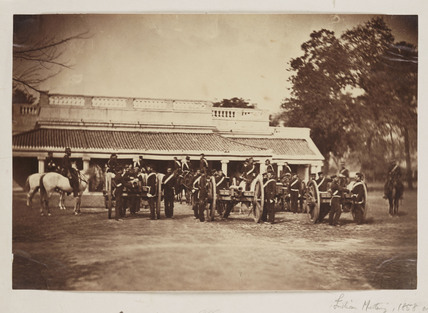 A photograph of a battery of artillery, taken by Felice Beato during the Indian Mutiny or Great Sepoy Rebellion (1857-1858). The breech-loading 12-pounder rifled cannon was of a very advanced design. Designed and manufactured by William George Armstrong (1810-1900) it is example of how advances in engineering directly influenced warfare in the 19th Century. Beato initially worked as a photographer in England. Around 1854 he began working with his brother-in-law James Robertson, based in Constantinople (Istanbul). Some photographs are signed 'Robertson, Beato and Co'. It is possible the 'and Co' refers to Felice's brother Antonio Beato. Robertson and Beato photographed the Crimean War in 1855 and afterwards the Indian Mutiny. 'Exterior of North fort on Peiho River...', China, 21 August 1860. 'The Bridge of Boats Over the Goomtee at Lucknow', c 1858. 'Lt General Sir Hope Grant GCD', 1860.